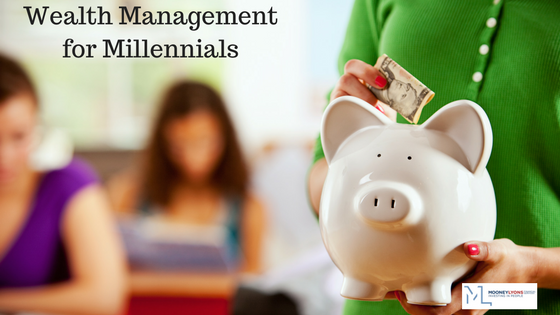 For millennials, planning a sound wealth management strategy early is critical to financial confidence in retirement. But how do you plan for the future in a climate of financial uncertainty? A series of careful, thoughtful steps, that’s how! Today we’ll share a few things a young investor should consider when formulating a wealth management strategy. Making a financial plan is an important first step to creating wealth. What are your goals? Do you want to retire young? Pay off student loan debt? Own a home? Knowing where you’re going requires a plan. Once you have one, a reputable investment advisor can take a look at your income, student loan debt and lifestyle to determine a sound investment strategy for you. Begin with referrals from family and friends to find the right financial professional for you. Once you identify a firm or firms, review websites and LinkedIn profiles to get a better picture of a firm, including their employees. Also, pay close attention to fees and service offerings. Good research will help you find an investment firm and an advisor you’re comfortable with. Maybe you’ve watched your parents struggle through an economic downturn and are skeptical when it comes to your financial future. The market crash has certainly generated much uncertainty for many millennials who are often doubtful about reaching the retirement of their dreams. A sound portfolio strategy is investment diversification. This will help you (and your money) manage the dips in the market. A good financial advisor can help you identify the appropriate investment vehicles for the job. Time financial expert Lena Masri advises making as much money as you can while you are young. Find ways to make additional income on the side, walking dogs, as an Uber driver, or waiting tables part time. Stashing cash now can escalate the time it takes to make it to your goals, whether it be a strong portfolio or a zero student loan balance. In addition to investments, your goal should be to build your savings so that you are prepared for financial emergencies as they arise, whether it’s a car repair or an unexpected medical bill. Automatically deducting a few dollars here and there into an emergency account is a great way to protect yourself against unforeseen expenses. You’re never too young to start planning out your investment future. To discover more about sound wealth management strategy for millennials, visit us at mooneylyons.com. The opinions voiced in this material are for general information only and are not intended to provide specific advice or recommendations for any individual. There is no guarantee that a diversified portfolio will enhance overall returns or outperform a non-diversified portfolio. No strategy assures success or protects against loss.